…as an investor in the mission leading Rockland County toward being a fully integrated, accessible community for everyone, you have helped BRiDGES to provide advocacy for people with disabilities throughout 2017 …and together, we are accomplishing the goals! 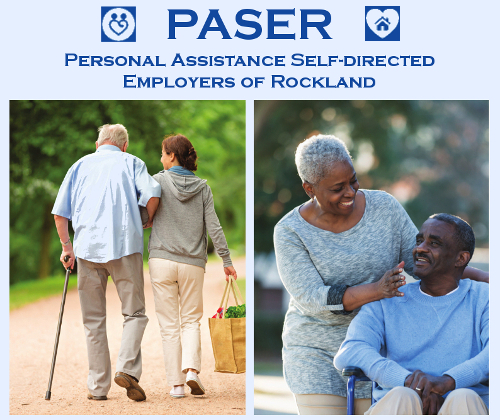 Personal Assistant Self-directed Employers of Rockland (PASER) is a Medicaid-funded program that genuinely empowers persons with disabilities to live with full autonomy in Rockland County. If you are a person with a disability, an older adult, or are in need of rehabilitation, you may qualify for a New York Medicaid funded program that allows people in need of personal assistance to stay in their own home and take control of their own care – avoiding the need for a nursing home or long term care facility. PASER allows you, or your designated representative, to take charge by hiring, training, and directing the care you receive. As the director of your own care, you employ your own Personal Assistant! You may hire anyone eligible to work – including friends and even some family members. This empowering and flexible alternative to home care puts you in control with the support of BRiDGES as the Fiscal Intermediary. Visit the PASER webpage for more information! All services are provided at no cost to persons served. ● Advocacy: Advancing Autonomy for People with Disabilities! ● Volunteer opportunities: Drivers Needed! ● Sponsorship Opportunities – CLICK HERE to learn how you can be a sponsor! Peer-Based Board of Directors in accordance with Independent Living philosophy. Core services for every Independent Living Center include: Advocacy, Peer Supports, Information & Referral, and Independent Life Skills. For Rockland County, BRiDGES is an excellent first place to go for every person and family faced with the challenges of a disability. The process begins with a simple Intake process to help understand the disability and resources available to address that disability. Through strategic partnerships with ACCES-VR, Rockland County (DSS, DMH, DOH, VSA), and more than 30 Community Based Organizations, BRiDGES helps you determine first steps toward making your own decisions about health care, employment, living situations, education, and every aspect of how you choose to live. Guided by peers – people who live independently with their own disabilities – core services help “BRiDGE” you to the services you need. And wait, there’s more! BRiDGES also offers Benefits Advisement and assistance for Housing, Education, Employment, and Nutrition Services – including a client-choice Food Pantry, Nutrition Classes, and Chronic Disease Self-Management. Flore Raphael addresses the audience at American Legion Post 310 with Sen. Gillibrand. U.S. Senator Kirsten Gillibrand visited Nyack American Legion Post 310 on Friday, November 10th, 2017 to urge the Senate to pass two pieces of legislation that would boost federal employment of veterans and protect the ability of veterans and service members to access justice by allowing them to exercise their right to be heard in court. The Empowering Federal Employment for Veterans Act of 2017 would make permanent and expand recent initiatives to improve veteran hiring practices in the 24 largest departments and agencies. The Justice for Service members and Veterans Act of 2017 would clarify and strengthen the rights of service members under the Uniformed Services Employment and Reemployment Rights Act of 1994 (USERRA). 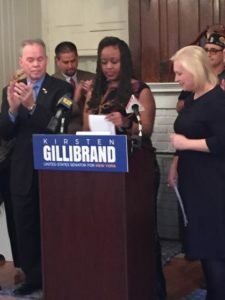 Sen. Kirsten Gillibrand & Izzy Quintana. “We must fight for our veterans and service members as hard as they fought for us. I am proud to support these two bills, and I urge all of my colleagues in the Senate to join me in standing up for our veterans and service members by supporting this legislation.” said Senator Gillibrand. Attending this event were Ismael “Izzy” Quintana and Flore Raphael, Veteran Outreach Coordinators for the PFC Joseph P. Dwyer Veteran Peer Support Program at BRiDGES. Ms. Raphael was given the opportunity to address the audience and share her personal story of being a recently returning veteran and the difficulty she had in finding employment. Click here to learn more about Senator Gillibrand’s visit.